Ira’s parents grow the most amazing garlic. I haven’t been cooking as much as I usually do and this year I have many heads left over from last years haul which, if not dealt with soon will start to dry up and go bad. 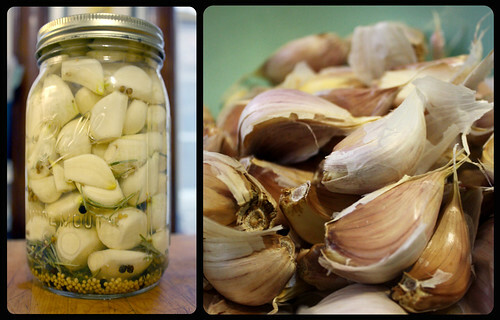 Pickling is a great way to preserve garlic. 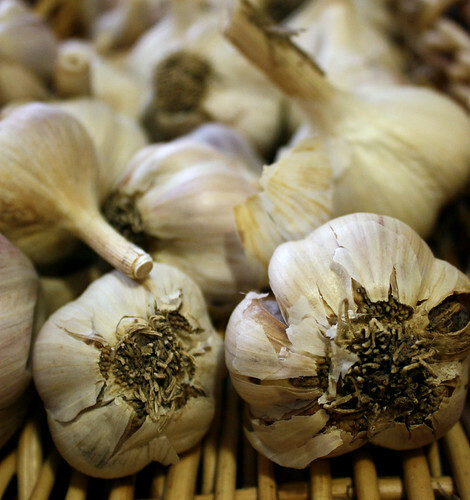 It helps retain many of its health benefits while reducing the pungency minimizing garlic breath! This quick and easy refrigerator pickle requires no processing and will stay good for many months to come. Prepare garlic: Skin garlic cloves. Cut off stems. Prepare brine: Boil water and vinegar. Once boiling add salt and sugar. Prepare jar: Stuff spices into a clean quart jar. Pack full with garlic cloves. 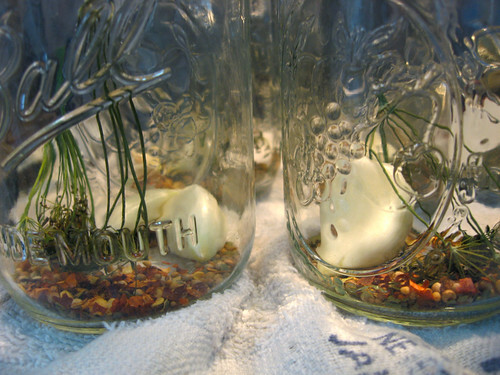 Pour brine over cloves. Allow garlic 2-4 weeks to pickle. Being from a family with an Austrian background, making our own sauerkraut was a natural part of every fall harvest. Now that I am an adult, my interest in making my own sauerkraut is more then just for the traditional cultural heritage. 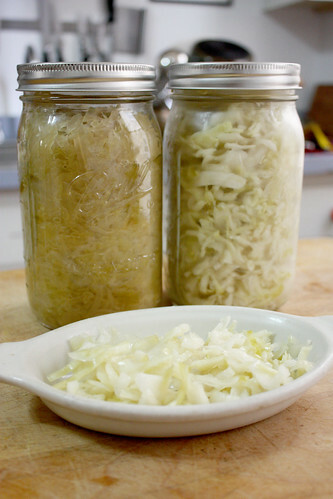 Fresh sauerkraut, being a fermented food, is an excellent source of probiotics which are so helpful in aiding the growth of healthy bacteria in your digestive system and lady parts (if you are a lady, that is). Not all sauerkrat is probiotic though. Most store bought and canned sauerkraut has been pasteurized and is no longer “alive” with the good bacterias. So if you want to be safe, make your own. Its super easy and fun. Plus, fresh sauerkraut tastes sooo much better then canned stuff. Its so easy, even my 1 year old can help. I guarantee! 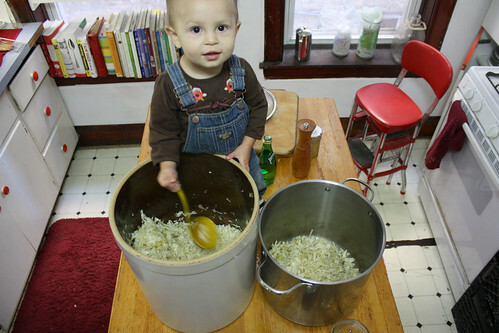 Thora scooping fermented kraut from the crock. This is just the basic ratio. You can multiply it as much as you want to make. I usually make it in bulk, using about 20 lbs of cabbage and 3/4 c. kosher salt. I save some for fresh probiotics and can the rest for winter storage. (The canned kraut will not be probiotic). Prep the cabbage: Cut cabbage in halves or quarters and remove stem. Remove soiled outer leaves. Shred cabbage: using a mandolin or shredding attachment to your food processor is easiest but you can also just be old school and cut into thin strips using a knife. Add salt to shredded cabbage and allow to sit 10-15 min. until the cabbage has noticeably wilted and softened. 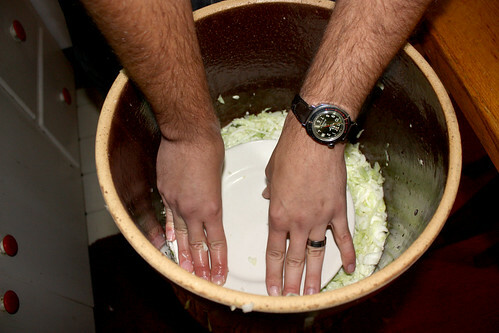 Ira panking cabbage down with a plate inside our crock. Pank cabbage: Transfer your cabbage into a suitably sized crock or glass jar. Pank cabbage down, which involves pushing caggabe down to try to remove as much space and air bubbles in cabbage as possible. I usually use a plate to help pank. If you are using a jar with a narrow opening, you can try using a ladle. 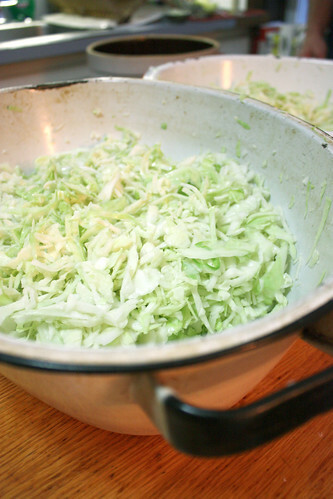 Ferment Cabbage: Weight cabbage down with a plate and cover lid of container with a towel to keep out dust. You don’t want to seal the cabbage off from the air because you will get better fermentation with air flow through your container. Allow the cabbage to sit for 3-4 weeks, depending on your taste. The longer you let it sit, the more tart it will become. I like mine tart, so I usually let sit for a month. 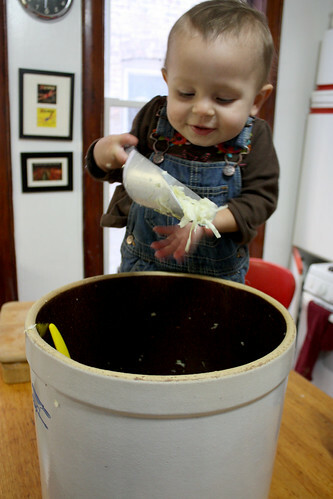 Thora helps me scoop fermented kraut from crock. We already put aside our fresh kraut and now are prepping the remaining kraut to be canned for long term storage. Refrigerate or can sauerkraut: Taste your fermented kraut to make sure its got the flavor you want. At this point it is done. Remove and discard any brown and discolored kraut at the top of the container. For your fresh probiotic cabbage, just place kraut in a container and chill in your refrigerator. It stays good for a long time. For more long term storage, you can can any extra kraut. Add a bit of water to your pot of kraut and heat until its almost boiling. Pack into clean hot jars and water process for 15 minutes per quart jar. This process kills your probiotics, but the kraut still tastes delicious! So to sum up, you just shred cabbage, salt it, set it in a cool place to ferment and you’re done. Easy! Fresh apples are one of the best parts of fall! Applesauce is super easy to make. Fresh apples are always so full of sugar, you doesn’t need any additives so it makes a perfect nutritious food especially for babies. We’re going to have 2 babies to feed this coming year, so I’m planning on canning at least 8 gallons. 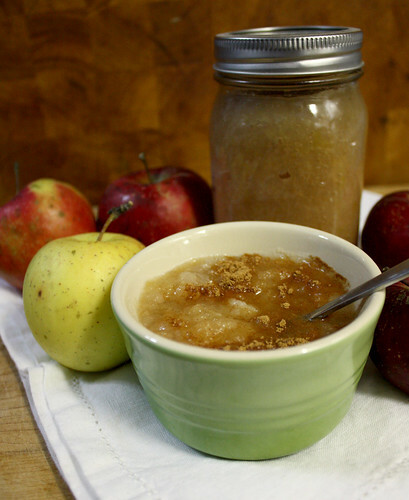 You may be thinking, is making your own apple sauce worth it? 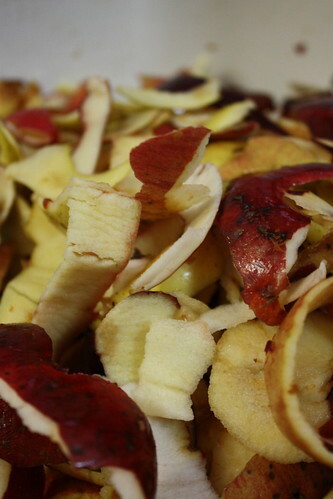 Even though it is easy, it can be a bit time consuming to core and peel apples enough for a good batch. Bon Appetite’s blog recently posted an article asking this same question. Their answer was, yes, it is worth it for a superior taste. Although they say it costs more to make it for yourself. This may be true if you buy apples in the best quality. However, if you can get them for free, or find discounted bruised ones at your local orchard, you can save a lot of money. Since you’re cooking them down, it doesn’t matter if there are some bad spots you need to cut out. Since we get our apples for free from my Aunt Shirley’s apple trees, our sauce costs us basically nothing to make gallons and gallons of delicious, nutritious organic apple sauce! Perfect for babies, children and adults alike! Let’s get cooking! Prep apples: Core and skin apples. Cut out any brown spots. 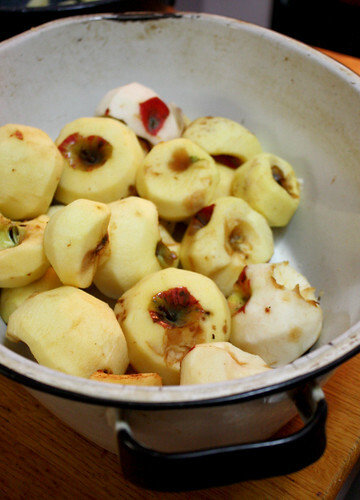 Cook apples: Place apples in a large enough soup pot. Fill pot with a couple inches of water. If you’re only doing a small amount of apples, just an inch will suffice. The water is just to keep the apples from burning the bottom of the pot before they’ve cooked down enough to make a sauce. Cook apples over medium low heat for 30-90 minutes, again depending on the amount of apples. Just cook them until they’ve cooked down into a sauce. Stir occasionally to keep it from burning at the bottom. 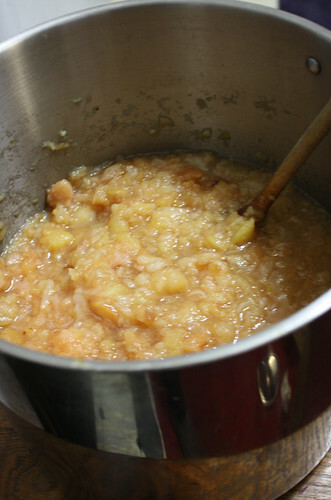 You can leave your apple sauce chunky or you can puree for a more smooth consistency. For small babies, a smoother consistency is better. Canning is a great way to store your applesauce. Apples have enough acidity so you can safely can them in a water bath with no additives. Just place your applesauce in a canning jar, seal using the proper sterilized canning lids and process in a boiling water for 20 minutes. Freezing is also an easy way to store applesauce. You can place in jars or bags and put in the freezer. For quick baby food, you can freeze single serving portions in an ice cube tray. Once they are frozen, remove from tray and transfer to a freezer bag. Everyone loves a pickle and when delivered in a crunchy green bean package, these pickles deliver an awesome punch. 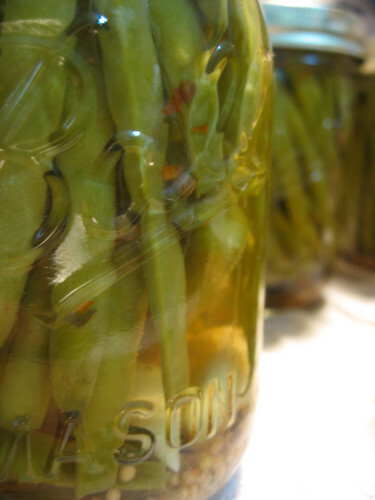 My pickled green beans are always a favorite at every party. And they are soooo easy to make. You can make them in your fridge to eat fresh, or you can can them to savor all year. Here are directions for both methods. Prepare your beans: Wash and remove stems. Make your brine: Bring water, vinegar and salt to a boil. Assemble your jar of pickles: You can use a large 1/2 gallon glass jar or crock. Heat jar or crock with hot water to temper for when you add boiling water. (Don’t skip this step or you might have a bunch of broken glass all over when you add your brine.) Place all spices, seeds and garlic in bottom of jar. Stuff with green beans. Brine: When brine is boiling, pour over beans. Screw on lid of jar or weight beans down with a plate if you are using a crock. Place in your fridge. Pickles should be ready in a week or so. Enjoy! Prepare beans: Wash and remove stems. If you are canning in pint jars, cut beans to fit into jars. 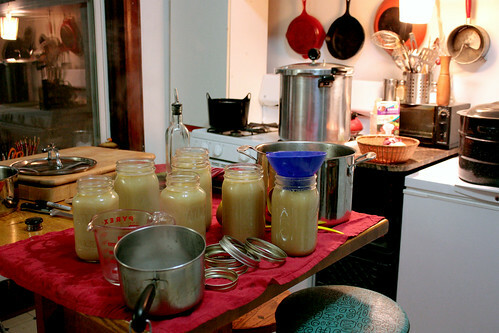 Prepare canner: Start enough water to cover your jars in canning pot. It usually takes a while for this amount of water to boil, so I usually start this first thing. Make brine: Add water, vinegar and salt to pot and bring to a boil. Prepare jars: Wash and clean jars. Heat up with hot water to temper jars for brine. (Don’t skip this step or you might have a bunch of broken glass all over when you add your brine.) Boil jar seals to prepare for sealing. Stuff jars as full as possible with beans. Make sure no beans are sticking up above rim of jar. Add brine: Pour boiling brine into jars leaving half inch head space. Seal using boiled seal and screw on lid. Screw lid on tight. Canned dilly green beans are good for a couple of years! Eat and enjoy. 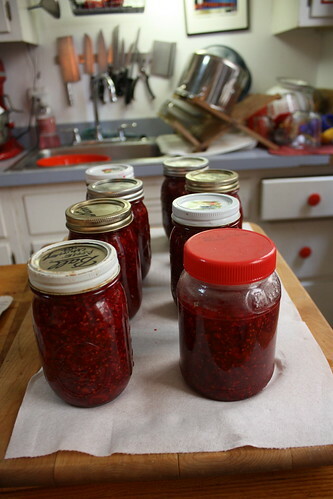 Want to make your own jam, but intimidated of the canning process? 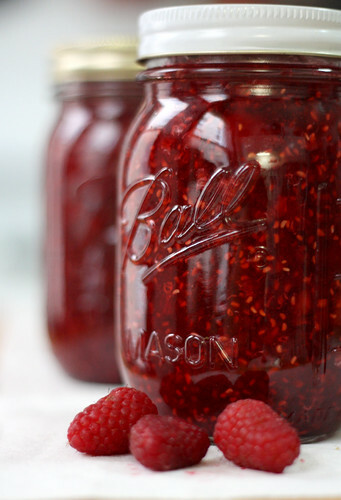 Don’t worry, here’s an easy way to make your jam and preserve it all year. We’re going to make freezer jam! What’s great about this method is that it does not take any fancy equipment, so anyone can do it! Yesterday I was able to get 6 pints of delicious raspberries for $1 each. I love getting a good deal! So, we’re going to make raspberry jam. The only special ingredient this recipe requires is powdered pectin to help the jam thicken. Sure-Jell is the most common brand which you can find in most major grocery stores. For this recipe, we’ll be using the pink box, which is the low sugar pectin. Select the jars or containers you wish to use for your jam. Wash and rinse containers. You don’t need any special containers, just ones with lids which seal tight to prevent freezer burn. Rinse raspberries. Place in a bowl and crush using a potato masher. Measure out 8 cups. In a large soup pot, measure out 7 cups of sugar, exactly. 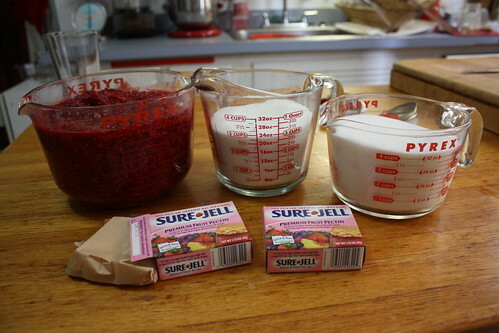 Add two packets of Sure-Jell pectin into sugar, stir until well mixed with sugar. Add 2 cups water and stir until mixed. Place sugar mixture on burner over medium-high heat. Stir constantly until mixture starts to boil. Boil and stir for 1 minute, exactly, and then remove from heat. Add crushed raspberries and stir into melted sugar mixture for 1 minute. 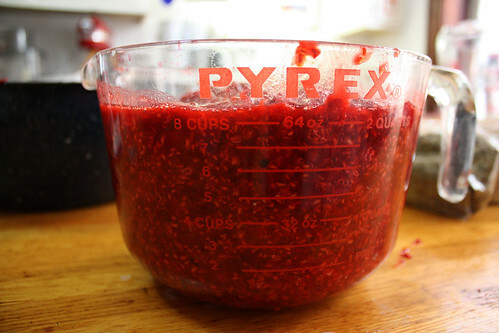 Pour jam mixture in your jars and seal tightly with lids. Allow to stand for 24 hours to set. Place jars in freezer. And eat at your leisure! *based on recipe from the Sure-Jell packet. Although I didn’t formally put this on my 2011 To-Do List, I’ve been wanting to can chicken stock in my new pressure cooker for a while. Its different from the one I’ve used in the past canning with my Mom. When I made a big batch of chicken stock this past weekend, I decided it was time for its maiden voyage. Since you can’t can chicken stock in a regular water boiling method because of its low acidity, I’ve always just frozen it. But whenever I want to use it, I always have to defrost it, which can be a pain. So I want to start canning it. 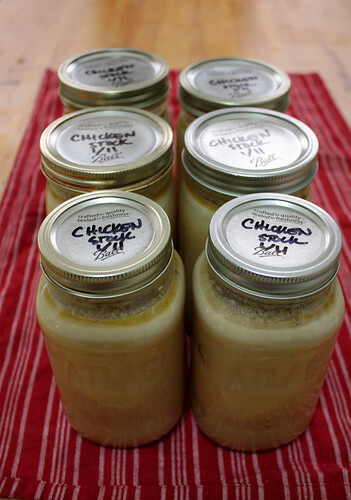 It is necessary to use a pressure cooker when canning chicken stock because the low acidity of the stock requires the jars be brought to a higher temperature then water boils at to kill off all harmful bacteria. 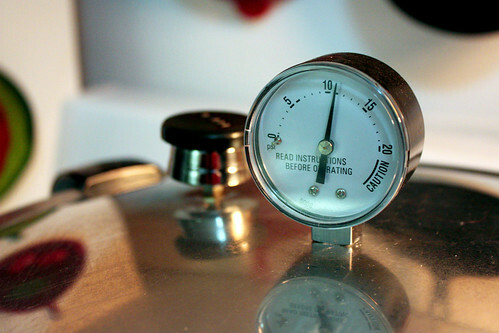 Following the directions of my new cooker, I needed to bring the pressure up to 11 pounds (as shown below in the pressure guage) for safe canning. Although pressure cookers can be very imtimidating, they’re actually very easy and safe to use as long as you follow their specific directions. The process begins similarly to canning with a water bath. After preparing a batch of chicken stock, straining it and bringing it back up to a boil. I ladled the boiling stock it into prepared mason jars (washed and heated) and placed the two part canning top and ring onto the jars. Prepare the pressure canner: Before beginning, I disassembled and cleaned every part of the pressure canner. The lid of the canner has a steam vent pipe which allows the steam to be released. Make sure nothing is blocking the free flow of air and steam through the vent pipe. When wanting to create pressure, you place a pressure regulator also known as a petcock over the vent. Have the petcock off the lid when beginning the canning process. To begin canning: Check the instructions for your canner and follow them exactly. This is the process for my Presto Canner: Place the 3 quarts of boiling water into the canner along with the jars (and lids) and twist the lid of the canner into place. Place canner on burner over high heat. Bring to a boil. Once a steady stream of steam starts coming out of steam vent pipe, allow steam to vent for 10 minutes. After ten minutes, place the petcock over the steam to regulate the pressure. Bring pressure up to 11 pounds and regulate pressure by adjusting the burner heat to medium-low to keep at 11 pounds. For quart jars, boil at 11 lbs pressure for 25 minutes. After 25 minutes, turn burner off and remove from heat. Allow to sit until pressure is down to zero again. DO NOT REMOVE petcock before the pressure has been reduced. When pressure is at zero again, remove petcock and allow canner to sit for 10 minutes or so to cool down. After ten minutes, remove lid. Keep face and hands away from the steam which will be released. Remove jars and allow to sit to cool. Label with name and date and place in pantry. 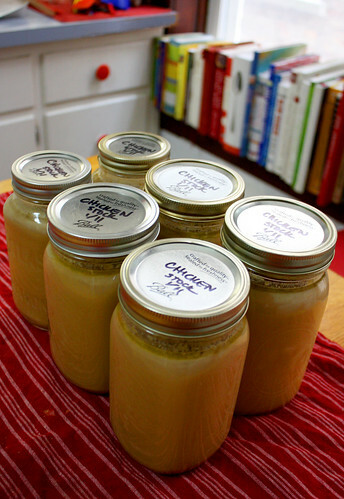 I know have 7 quarts of chicken stock which is ready to use whenever I want it without having to defrost it first. Yus! 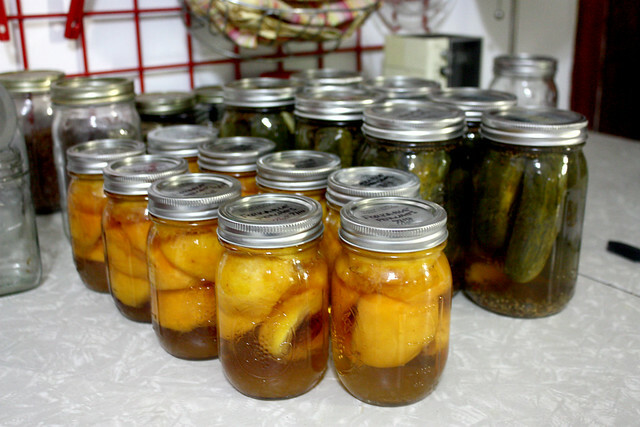 Canning peaches is easy and fun. Because of their high acid content, they can easily and safely be preserved through the water boiling canning method using a sugar syrup as a preservative. 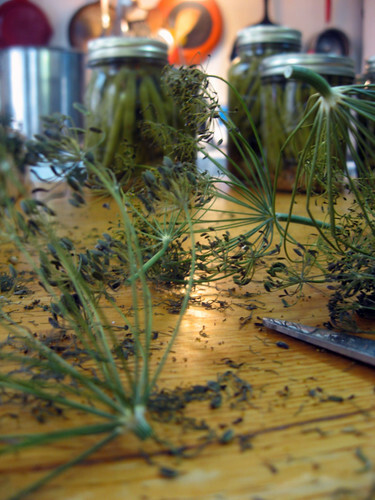 So, come on…lets get canning! 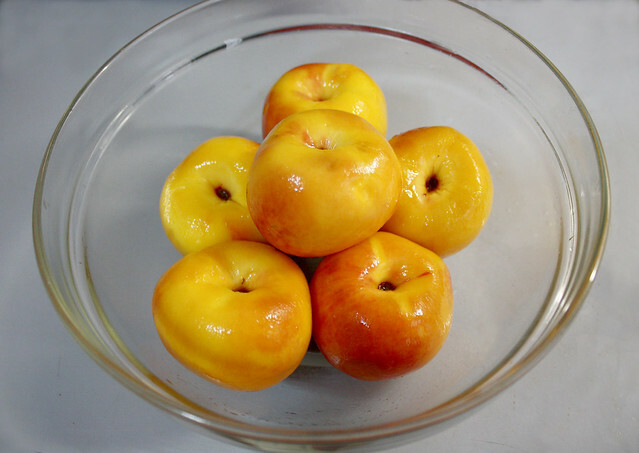 Poach peaches in boiling water and then soak in cold water. Skins should come off easily. Remove pit and cut in half. Treat to prevent darkening. ( soak in 1 gallon water: 1Tbs salt: 1 Tbs vinegar or use fruit fresh powder). Make syrup: combine sugar and water, bring to a boil. Bring down to a simmer. 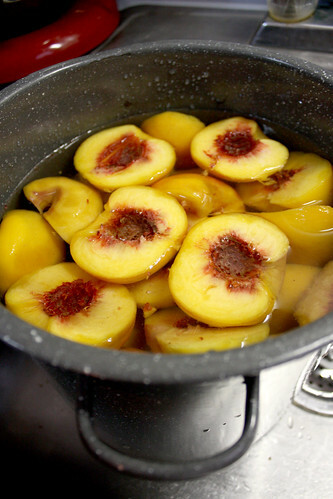 Simmer peaches in syrup for 3 minutes. 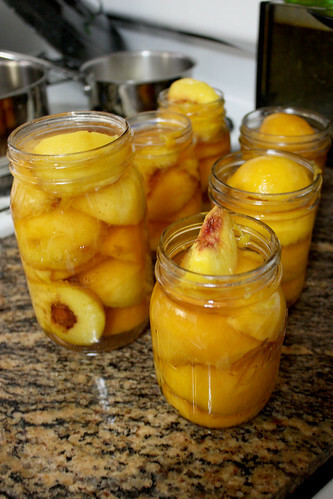 Remove peaches and pack into clean hot jars. 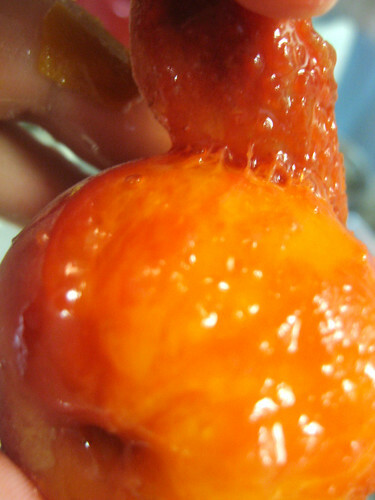 Pour syrup over peaches. Seal jars. Process in boiling water. Pints for 20 minutes, quarts for 25 minutes.